I have been following along Stacy's summer class Have More Fun and really it's more than having FUN. In August she was explaining photo album scrapbooking and I realized it was an album like that, that sparked our relationship. It's what she calls an ONgoing Album Project - an album that you update on an annual/ongoing basis. An event for me is Christmas. Remember the 'days' when Christmas photos meant you were doing 8 to 10 layouts??? Or I remember some people would dedicate one whole album to that ONE day! 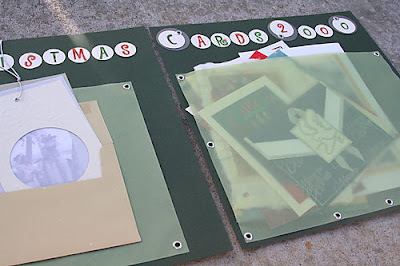 Well after reading Stacy's first book Simple Scrapbooks, I realized the freedom I could have with 'theme' albums - that I did not have to scrapbook chronologically or I could within a 'theme' album. 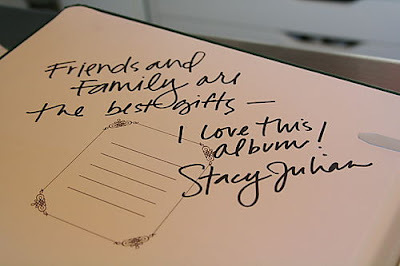 So I started this Christmas album - which I had Stacy sign when I met her for the first time! :) These pages are no longer in that CM strap hinge album - but I did take a picture of the cover before I gave it away. 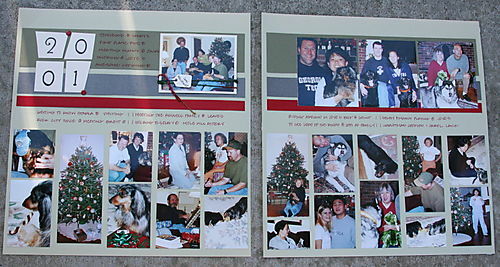 Each year has four pages - first page that features the Christmas card we send out, second page is a pocket that holds the special cards we receive, third and fourth pages are a collage of pictures. I use the same format for each page, just changing the colors and using very little embellishments. I use the same template/sketch for each year. I will continue to do so until I grow tired of it - so far I don't think I will grow tired of something that is working for me! 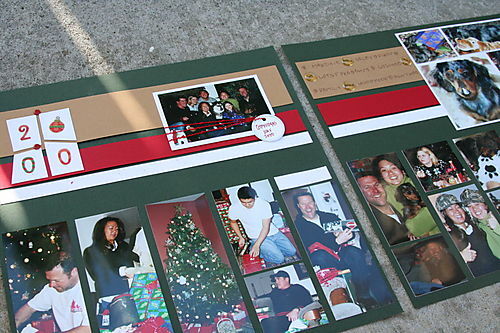 The one thing that I really enjoy about having an ONgoing Album like this, is that when I feel like scrapbooking Christmas I can. It also prevents me going over board buying all the beautiful Christmas product that is out there. I chose a few elements; brads and fiber for the one above. 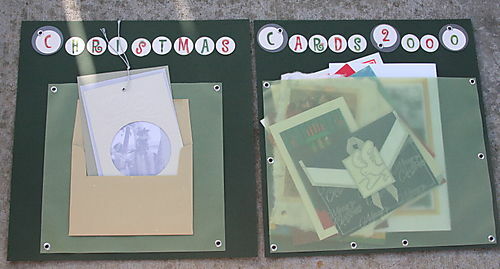 For the most part it is just card stock. 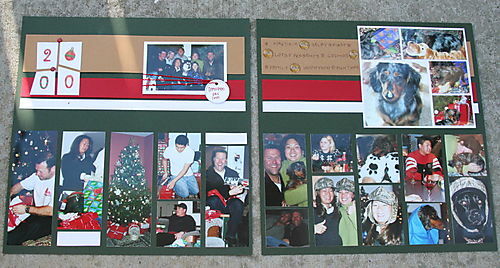 These Christmas layouts are now in an AC green Cloth-D ring album. Thanks for looking - have a great holiday weekend!